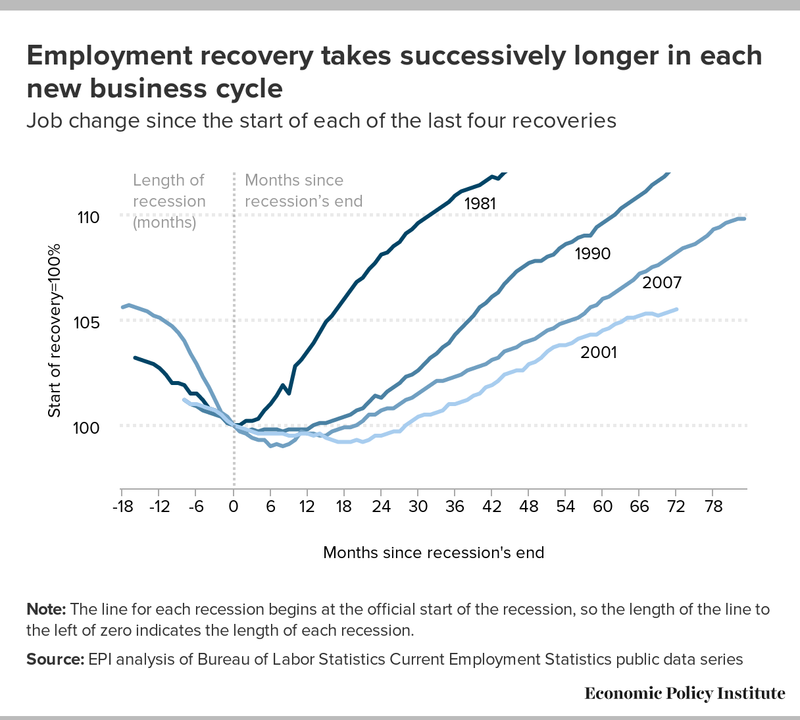 Since the recovery’s trough in June 2009, employment took longer (51 months) to reach its pre-recession peak than in any other of the previous three recoveries. Much of this too-slow march back to the pre-recession employment peak can be attributed to the length and severity of the Great Recession itself—the economy had a much larger hole to dig out of. But the pace of job growth in the recovery phase following the recession was also slow relative to previous recoveries—slower than any on record except the recovery in the early 2000s. At the trough of the Great Recession the economy was more damaged than at the trough of any postwar business cycle; only the 1982 trough was comparable. The ability of conventional monetary policy to spur recovery following the Great Recession was more limited than in any other postwar recovery. Given the degree of damage inflicted by the Great Recession and the restricted ability of monetary policy to aid recovery, historically expansionary fiscal policy was required to return the U.S. economy to full health. But this government spending not only failed to rise fast enough to spur a rapid recovery, it outright contracted, and this policy choice fully explains why the economy is only partially recovered from the Great Recession a full seven years after its official end. The recession that began in December 2007 and ended in June 2009 was the longest in postwar history. Its cause was the same as that of every other postwar recession—a deficiency of aggregate demand, meaning that the spending of households, businesses, and governments was not sufficient to keep the economy’s resources fully employed. In the case of the Great Recession, the demand shortfall was enormous, and it developed suddenly when the multitrillion-dollar bubble in real estate burst. Whatever the source of demand shortfall in a recession, the policy remedy is always the same: boost aggregate demand. In terms of monetary policy, this means that the Federal Reserve cuts interest rates to spur borrowing and hence spending. For fiscal policy, this means either a temporary burst of spending by government and/or tax cuts to spur spending by consumers. Some of the temporary burst is automatic and happens without new legislation: Unemployment insurance and food stamps, for example, rise automatically when recessions hit. But sometimes, as with the Economic Stimulus Act of 2008 signed by George W. Bush and the American Recovery and Reinvestment Act (ARRA) of 2009 signed by Barack Obama, the temporary stimulus is legislated. Taking this argument to its logical conclusion, the sluggishness of the current recovery arises from a prolonged failure to fill the gap between aggregate demand and the economy’s potential output. Figure A shows payroll employment growth following the trough of the most recent four recessions.1 The pre-recession employment peak is shown at the start of each line. The employment recovery from the trough to the pre-recession peak takes successively longer in each new business cycle: 11 months in the early 1980s, 23 months in the early 1990s, 39 months in the early 2000s, and 51 months following the Great Recession. Note: The line for each recession begins at the official start of the recession, so the length of the line to the left of zero indicates the length of each recession. One key gauge of the severity of recessions is the output gap, which measures the difference between the economy’s actual output and its potential output if all resources (including workers) were fully employed. At the trough of the Great Recession in June 2009, the output gap was 7.1 percent (Table 1), equivalent to over a trillion dollars. The only larger output gap in the postwar period was the 7.6 percent gap recorded at the trough of the early 1980s recession in the last quarter of 1982. Cumulatively, the losses over the Great Recession and the sluggish recovery dwarf even those from the early 1980s recession. The output gaps at the trough of the early 1990s recession (the first quarter of 1991) and that of the early 2000s (the final quarter of 2001) were 2.6 and 1.8 percent, respectively. Note: Data on growth in government spending over first 27 quarters of recovery is author’s analysis of data described in Figure B. It is possible to infer from the size of the output gap at a recession’s trough how much policy assistance is needed to push the economy back to full recovery. The recession of the early 1980s and the Great Recession are similar in this regard. Traditionally, the quickest policy response to recessions is provided by the Federal Reserve, which uses monetary policy to reduce short-term interest rates. But there was much more scope for this type of conventional monetary policy to aid recovery in the early 1980s than in the Great Recession. At the trough of the 1980s recession, the federal funds rate (the key short-term interest rate controlled by the Fed) was over 9 percent. It was just 0.18 percent at the trough of the Great Recession.3 Generally, there is a zero-bound on how low the federal funds rate can be pushed. This means that there was much more room to move down the federal funds rate following the 1982 trough when compared to the 2009 trough. Further, the output gaps were substantially smaller at the troughs of the early 1990s and early 2000s recessions, and so monetary policy did not have to work as hard to return the economy to full employment. Another variable influencing the scope for monetary policy is the inflationary momentum coming out of a recession. Because consumption and investment decisions are made on the basis of real interest rates (interest rates adjusted for inflation), and because higher rates of inflation reduce (all else equal) these real interest rates, exiting a recession when inflation rates are higher gives more scope for cutting real interest rates and boosting the economy. At the 1982 trough, core inflation (inflation rates excluding volatile energy and food prices) had been 5.9 percent over the previous year; at the 2009 trough, core inflation had been just 1.2 percent. Again, there was much more scope for monetary policy to boost growth following the 1982 recession than when we began exiting the Great Recession. And again, even following the much-milder recessions of the early 1990s and early 2000s there was more scope for monetary policy on this front as well: Core inflation was 3.8 percent in the year ending in the 1991 trough and was 1.8 percent in the year ending in the 2001 trough. In sum, after the Great Recession the economy was more damaged than it had been after any other recession in postwar history, and low interest rates and low inflation meant that conventional monetary policy had much less scope than in the past to aid recovery. The implication for fiscal policy should have been clear. 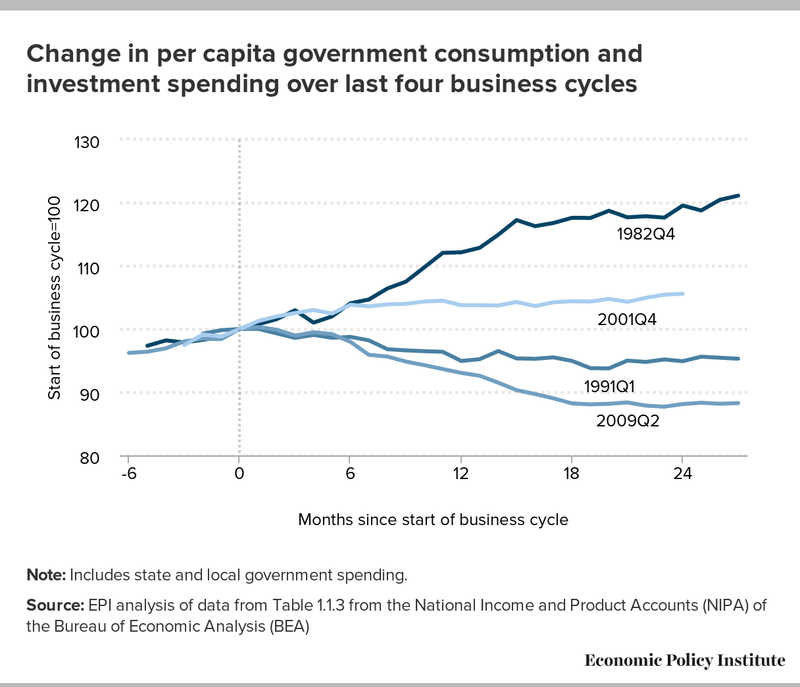 Figure B shows the growth in per capita spending by federal, state, and local governments following the troughs of the four recessions. Astoundingly, per capita government spending in the first quarter of 2016—27 quarters into the recovery—was nearly 3.5 percent lower than it was at the trough of the Great Recession. By contrast, 27 quarters into the early 1990s recovery, per capita government spending was 3 percent higher than at the trough, 23 quarters following the early 2000s recession (a shorter recovery) it was 10 percent higher, and 27 quarters into the early 1980s recovery it was 17 percent higher. Note: For total government spending, government consumption and investment expenditures deflated with the NIPA price deflator. Government transfer payments deflated with the price deflator for personal consumption expenditures. This figure includes state and local government spending. If government spending following the Great Recession’s end tracked spending that followed the recession of the early 1980s for the first 27 quarters, governments in 2015 would have been spending an additional trillion dollars in that year alone, translating into several years of full employment even had the Federal Reserve raised interest rates. In short, the failure to respond to the Great Recession the way we responded to the other postwar recession of similar magnitude entirely explains why the U.S. economy is not fully recovered seven years after the Great Recession ended. Who is to blame for the post–Great Recession austerity? Federal spending growth following the Great Recession is clearly slower than it was following the early 1980s and early 2000s recessions but on par with spending growth following the early 1990s recession. At the state and local level, slow growth of public spending is even more pronounced, and state and local policymakers deserve blame for adopting austere spending policies, such as the decision, by 19 states, to refuse free fiscal stimulus from the Medicaid expansion under the Affordable Care Act. However, even despite the fact that most of the slow growth in total spending during this recovery can be accounted for by state and local spending trends, the lion’s share of the blame for fiscal austerity during the recovery should still accrue to Republican members of Congress in Washington, D.C. The reason for this is simple: State and local policymakers face spending constraints that do not apply to federal policymakers. Most specifically, these state and local policymakers by and large have to balance the operating portions of their budgets by law. They can admittedly borrow to finance long-run infrastructure projects, but have been unwilling to do so (as is documented by McNichol (2016)). 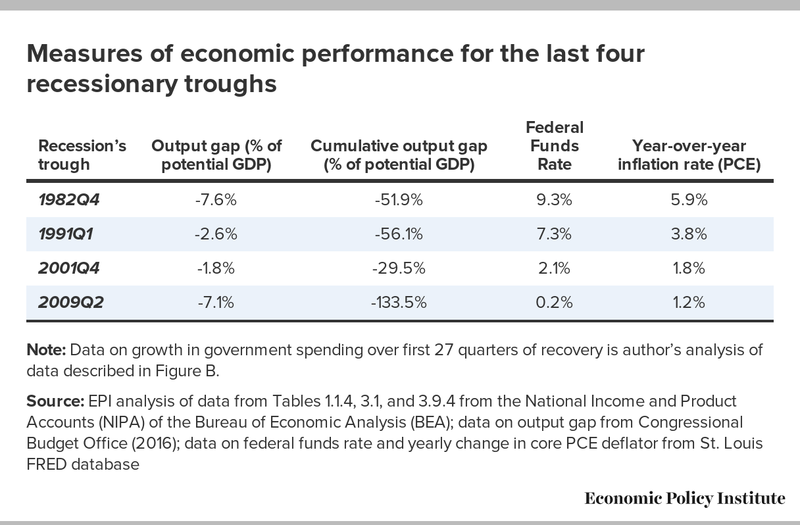 But even besides the legal strictures against running operating deficits (a stricture not constraining federal action), states also face real economic constraints to undertaking fiscal stimulus. To put it most simply, states do not print their own currency. This means that they really do have to be more cautious about running up debt that sometimes erratic financial markets can decide (rightly or wrongly) is unsustainable. In short, states do need to at least keep one eye on the “bond vigilantes” in financial markets that can appear to punish entities that are perceived to be too profligate. The federal government, on the other hand, is free to run deficits, and, because it can print its own currency, bond vigilantes cannot spark a self-fulfilling financial crisis. Further, even during normal times, transfers from the federal government to states account for more than 20 percent of total state and local resources for spending, and there is no reason that federal aid to states could not have been more forthcoming. Even the timing of austerity over the current recovery is fairly easy to pinpoint in actions undertaken by Republicans in Congress. The Obama administration championed and signed the ARRA during the recession in early 2009, and the law led to a sharp uptick in government spending that persisted throughout the early stages of the recovery.5 Through the end of 2010 (when the ARRA had mostly petered out), total government spending per capita was not that different than in previous recoveries (and actually rose more rapidly than in previous cycles during the recession phase). But in 2011 Republicans in the House of Representatives demanded spending cuts as a precondition for raising the debt ceiling, a vote that had historically been pro-forma (the ceiling has been raised 78 times just since 1962). The resulting Budget Control Act of 2011 has significantly reduced the growth of discretionary spending. Both in word and deed, Republican lawmakers have embraced and enforced fiscal austerity, and the result has been the most discouraging recovery on record. The recovery since 2009 has been historically slow, and the disappointing pace can be explained entirely by the fiscal austerity imposed by Republicans in Congress. Of course, other national policymakers are not completely blameless. While the Federal Reserve pushed beyond the bounds of conventional monetary policy to fight the recession and aid recovery, there are reasons to think that it could have done more. The Obama administration issued several calls for more expansionary fiscal policy (like the American Jobs Act of 2010), but it had no unilateral power to pass more expansionary policy. Yet it could have made a louder and more consistent case that the slow recovery had concrete, identifiable roots in decisions made by Congress. Had the Obama administration made such a powerful case for why austerity was hampering growth, it could have educated the public and potentially helped build support for more sensible policy the next time the United States faces a recession. But these caveats about the Fed and the Obama administration are mostly quibbling. By far the biggest drag on growth throughout the recovery from the Great Recession has been the fiscal policy forced upon us by Republican lawmakers in Congress and austerity-minded state legislatures and governors. 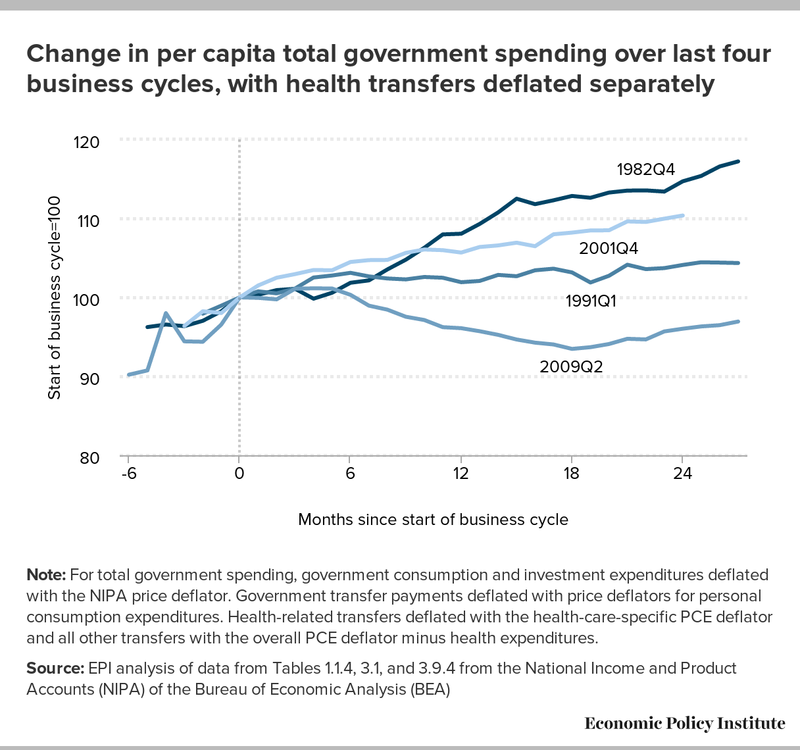 Figure B shows total government spending—consumption and investment spending plus transfers to persons—for federal, state, and local governments at similar points during the last four recoveries. This appendix breaks the spending down into those components to show that the pattern is robust among them. Appendix Figure A1 uses data found in the gross domestic product data from the National Income and Product Accounts to examine government consumption and investment spending alone. It excludes government transfers to persons—items like unemployment insurance, food stamps, Social Security, and Medicare. (Given that these transfers constitute a majority of government spending, as well as a large source of traditional antirecessionary spending, it seems important to us to include them in the analysis.) We use the real measures for government spending and investment provided by the NIPA data and deflate nominal figures on transfer payments by the price index for personal consumption expenditures (PCE deflator) to get the real value for these transfers. Note: Includes state and local government spending. A growing share of these transfer payments is going to purchase health care for households. Given that health care prices have tended to grow more rapidly than overall prices, we separated the transfers into health- and non-health-related spending and deflated them separately with the health-care-specific PCE deflator as well as a non-health-care PCE deflator. 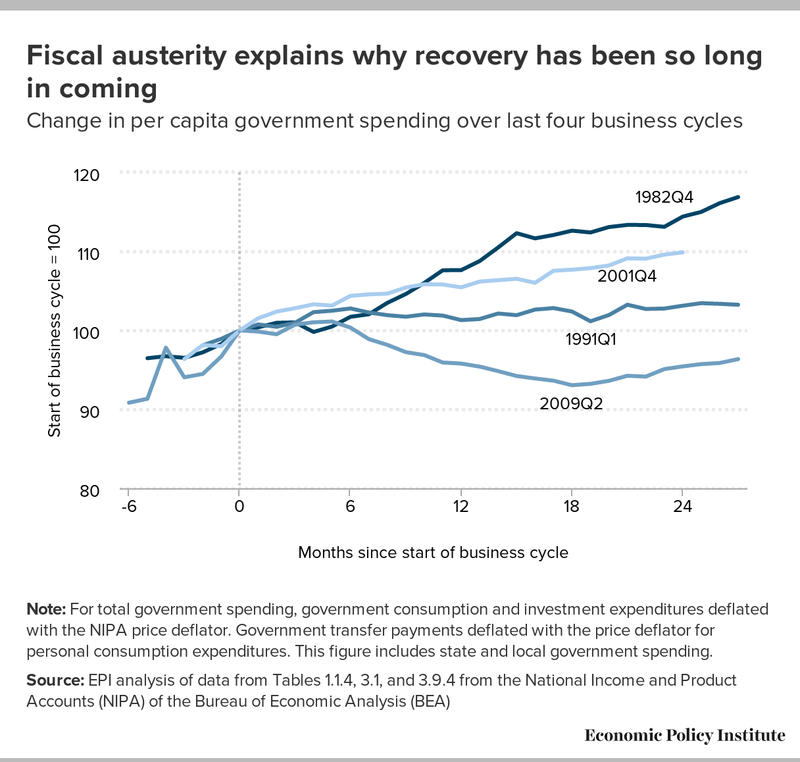 This had little effect on overall trends or the overall characterization of public spending growth in the current recovery relative to previous ones, as can be seen in Appendix Figure A2. Note: For total government spending, government consumption and investment expenditures deflated with the NIPA price deflator. Government transfer payments deflated with price deflators for personal consumption expenditures. Health-related transfers deflated with the health-care-specific PCE deflator and all other transfers with the overall PCE deflator minus health expenditures. Finally, we show the same calculation for just federal spending in Appendix Figure A3. While a large gap between spending in the current recovery relative to the early 1980s and early 2000s recovery remains, the early 1990s recovery looks almost as austere as the current one. There are a couple of things to note about this, however. First, 27 quarters into the 1990s recovery the Federal Reserve had already raised short-term interest rates to over 5.5 percent. Today, 27 quarters into the current recovery, these rates stand at 0.3 percent. Policymakers seemed to see much more momentum at this point in the 1990s recovery, and their perception seems well-founded if one compares data on growth in per capita GDP since each recovery’s trough: Annualized growth in the first 27 quarters of the early 1990s recovery was 3.6 percent, compared to 1.3 percent in the current recovery. All of this makes it clear that the current recovery needs more policy help in a more pressing way than the early 1990s recovery did. Note: For total government spending, government consumption and investment expenditures deflated with the NIPA price deflator. Government transfer payments deflated with price deflators for personal consumption expenditures. 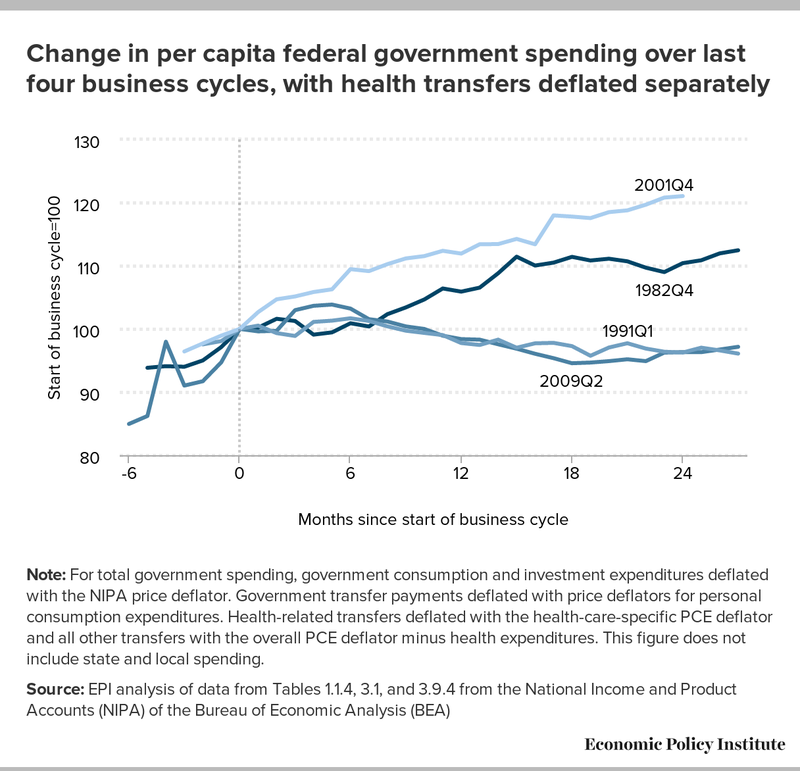 Health-related transfers deflated with the health-care-specific PCE deflator and all other transfers with the overall PCE deflator minus health expenditures. This figure does not include state and local spending. Second, the apparent austerity of the early 1990s was driven by defense spending, which fell from 6.9 percent of GDP in 1989 to just 4.0 percent in 1998. The defense spending decline in recent years is substantially smaller; it fell from 4.7 percent in 2007 to 4.1 percent in 2015. If defense spending has smaller multiplier effects (particularly on domestic employment), then the early 1990s austerity might have dragged on growth less than the overall data might lead one to believe. 1. The main reason we restrict attention to the last four business cycles is ease of comparability. Business cycles before the 1980s tended to be shorter and more frequent, whereas the post-1980s cycles all lasted nearly as long as the current recovery. Also, the 1981 recovery proxies well for all previous cycles in terms of GDP growth and growth in public spending, so it provides a convenient stand-in. 2. The contention that the severity of the recession makes recovery to a pre-recession peak take longer can perhaps be better addressed by indexing employment levels to the previous business-cycle peak rather than to the recession’s trough. We index here to the trough because the issue this paper aims to address is how well policymakers have managed the recovery from the Great Recession. Nobody would argue that the Obama administration was responsible for the Great Recession; it started more than a year before Obama took office. But the administration can be held to account for its response. In any case, Figure A displays the trajectory of employment losses before the recession’s trough, and so the recession’s severity remains fully visible. 3. The Fed cut the federal funds rate sharply relative to its pre-recession levels during the recessionary phase of all postwar business cycles. The focus on its value at the trough of the recession is to point out that conventional monetary policy had much less scope to boost the underlying pace of recovery. 4. This brief highlights austerity on the spending side. In theory, fiscal stimulus could be provided through tax cuts rather than spending. But to overturn our assessment of the effect of stimulus provided in the current recovery versus previous ones, it would have to be the case that there were much larger tax cuts since 2009 than in previous recoveries. This is not the case. A payroll tax holiday was enacted for 2011 and 2012, but income taxes rose substantially in 2013 as the high-income tax cuts passed in 2001 and 2003 expired. More importantly, recovery from the recessions of the early 1980s and early 2000s was accompanied by historically large cuts in income taxes signed into law by the Reagan and George W. Bush administrations. The recovery following the early 1990s recession was accompanied by substantial tax increases overall, so it could be the case that accounting for taxes makes the current recovery look better in terms of fiscal stimulus provided relative to that one. But including taxes would also widen the gap between the fiscal stimulus provided in the current recovery and the stimulus provided in the early 1980s and early 2000s recoveries. 5. It is worth noting that the single largest quarterly spike in government spending happened under George W. Bush. The Economic Stimulus Act of 2008 led to a $100 billion increase in government transfers in a single quarter in that year. While often characterized as a tax cut, most of the act’s stimulus shows up in national income and product accounts data as a federal government transfer. Bureau of Economic Analysis (BEA). National Income and Product Accounts interactive data. http://bea.gov/iTable/index_nipa.cfm. McNichol, Elizabeth. 2016. “It’s Time for States to Invest in Infrastructure.” Policy Futures Report. Center for Budget and Policy Priorities.